I have always enjoyed a good haunted house story and Hell House is exactly that—a good haunted house story. In fact it is one of the best that I have ever read. It is also the book that inspired the film The Legend of Hell House, starring Roddy McDowall, Gayle Hunnicutt and Peter Bowles. The book is about 300 pages long and is not divided up into traditional chapters but is, instead, separated by dates and times, with the date being the equivalent of a chapter and the time forming a kind of sub-chapter. The story is set in the December of 1970 and begins on the eighteenth, at 3:17 in the afternoon. I should probably mention here, however, that the story is not written in a journal style; but in the third person and so the viewpoint character changes from time to time. At 3:17, on the 18 December 1970, though, the viewpoint character is Dr Lionel Barrett. Barrett is a parapsychologist and he has been waiting for over an hour to see an eighty-seven-year-old millionaire named Rolph Rudolph Deutsch. Deutsch is a dying man and the parapsychologist has never met him before and so has no idea why the millionaire has requested to see him; although he guesses that it will have something to do with parapsychology. Barrett’s guess is correct; the dying man is looking for proof of survival after death. Deutsch’s ‘people’ have recommended Barrett for the job because he is believed to be one of the best in his field. His people never told him though, that Barrett is a cripple and Deutsch mentions this fact with a stunning lack of tact. Barrett is in his fifties and was crippled by polio when he was just a young man, but he does not take obvious offence to the millionaire’s statement. Especially not when he discovers that Deutsch is prepared to pay him $100, 000 to bring him the proof he requires-one way or the other. Either way, he will pay him for the information, even if it is not what he wants to hear. He plans to send Barrett to The Belasco House in Maine-a place that has seen to much paranormal activity that it is more commonly referred to as Hell House. Hell House was built in 1919 by a man named Emeric Belasco. He was an evil man who created his own private Hell within the walls of the house. Anything was considered acceptable in Belasco’s house. Nothing was considered too sick or depraved. People came and visited and never went home. They became so accustomed to the animalistic way of life in Hell House that they just didn’t want to leave. By 1928 orgies of mutilation, murder, necrophilia and cannibalism were a part of everyday life in Hell House, but by then Belasco no longer chose to be actively involved, he preferred instead to just watch the hell on earth that he had created. In the November of 1929 the worried relatives of some his guests had the authorities break into the house. Everyone inside was dead, but Belasco’s body was never found. Barrett will not be going to the Hell House alone. The millionaire insists that two other people accompany him: a medium name Florence Tanner and the only person who has ever survived an encounter with Hell House, Benjamin Franklin Fischer, who is also a medium. Florence Tanner used to be an actress. She is a very attractive woman, but she chose to leave the bright lights behind her and opened up her own Spiritualist church. Florence’s church is only a converted store though. She dreams of better things and $100, 000 would buy her the kind of church that she wants. When he was just a child Ben Fischer was one of the most powerful mediums in the world. He was fifteen-years-old when he took part in an investigation of Hell House. There were other mediums with him, as well as scientists and parapsychologists-A full team. All, but two of them died. Ben was found curled up naked and unconscious outside the house on a September morning in 1940. The other survivor could not be said to have really survived the encounter at all because he has been living in an insane asylum ever since. Barrett is not happy about having Tanner and Fischer forced upon him, but he has little choice in the matter and the group of three quickly becomes four when Barrett’s wife Edith also insists on tagging along. Edith does not handle separation from her husband well. She finds it hard to cope on her own and so she has always accompanied him on his investigations. This is to be no ordinary investigation though, and Barrett is worried for his wife’s safety. From the moment the team of investigators arrive strange things happen; the front door had been left unlocked for them, but is mysteriously locked when they try and open it and then the generator packs up, leaving them without electricity until Deutch can arrange delivery of a new one. Possibly the strangest thing of all is when an old gramophone starts playing on its own. The record on the turntable was recorded fifty years previously, by Belasco, and it contains a speech welcoming them to his house. Things escalate quickly and the house, or someone or something in the house, begins to work on the group, separating them so that they cannot function properly as a team. Two members of his team are mediums, but Barrett’s beliefs are more scientific, so there is already a tension there. Because of his health problems Barrett and his wife do not enjoy a physical relationship and so that also presents an area of weakness for the house to work on. For most of the book Fischer is the least effected by the goings on in the house because he chooses to ignore his gift and blocks out the house’s influence entirely. Later though, when the situation becomes more extreme, he has little choice and has to use his powers to fight back. This book contains a bit of everything, from corpses bricked up in the cellar and swaying chandeliers to flying dinner plates. Strange things are seen heard and felt by all of the characters and each one of them has their own opinion about what is really going on, although each of them would probably admit that their theories only scratch the surface of what is a much deeper puzzle. Matheson generates a dark atmosphere in the house from the very beginning of the story and he keeps it up until the end. The characters are unique and believable and find themselves having so many problems to deal with that it is hard not to feel sorry for them. 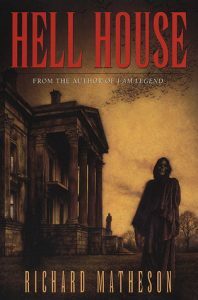 As I mentioned at the top of the page, Hell House is one of the best haunted house stories that I have ever read, if you are also a fan of such stories then I can highly recommend it to you and there are lots of twists and turns in the tale. If you prefer, however, horror stories that are about serial killers, or the constant search for blood and guts, then Hell House probably won’t be up your street at all.